The 21st century has definitely been the age of innovation, with technology advancing at a phenomenal rate. Undoubtedly, the technological breakthroughs have drastically revolutionized people’s day-to-day lives. Nearly everything is now a reality which we would have never thought possible back in the 90’s. 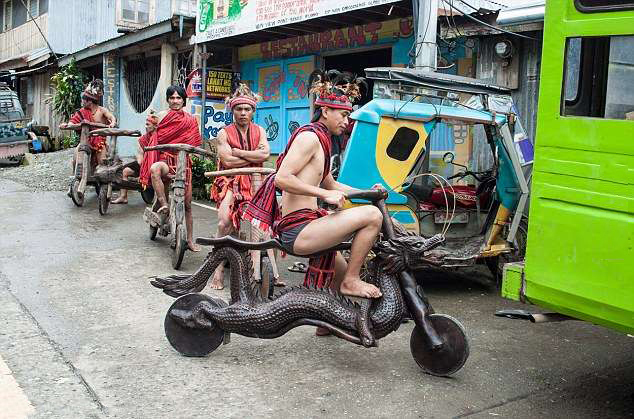 Meanwhile in the Philippines, a special tribe has found innovation as the answer to making modern things such as bicycles into customary in various creative ways imaginable. The aborigine tribe known as the Igolot-Garonne shows off their excellent wood-carving skills. With the huge ornate homemade bicycles carved by their tribesmen, they can participate in their very own road races. The front of the two-wheeled vehicle is noticeably designed with an animal theme from the head of a horse, dragon, lion, etc. Photographer Richard Haw captured the moment when the unconventional “motorcycle” gang pulled into the town of Batad in the Philippines. 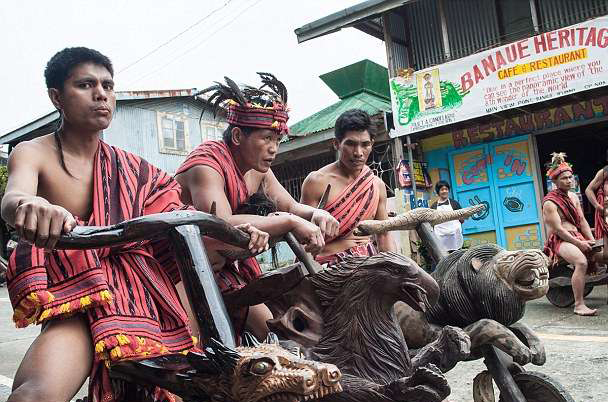 Reaching speeds of up to 25mph as they raced each other downhill, riders do not wear any protective gear and only don their traditional highlander g-string called a bahag and a dyed red robe which distinguishes the tribe they belong to. These men slow down by stepping on a wooden pedal which puts pressure on a piece of thick recycled tire. Enough friction is generated to slow the scooter down and their feet do the rest.